What Is Acupuncture / Meridian Therapy? The human body’s energy flow called “chi”, courses over twelve meridians or channels that normally are well balanced. A disruption of energy flow can alter the entire system producing pain or symptoms in the body. Meridian therapy treats many different health conditions, affecting both the physical and emotional well being of the person. For example, sciatica, headaches, sinus conditions, infertility, pinched nerves, to name a few. Early Chinese physicians discovered an energy network traversing just below the surface of the skin. Communication flows from the exterior to the internal organs and structures touching over 1,000 ‘Acupoints’ on the body. This energy works in harmony with the body’s circulatory, nervous, muscular, digestive, and genitourinary systems of the body. If this vital energy becomes blocked or weakened, it affects a body system or anatomic location. Stimulation of one or a combination of key ‘Acupoints’ on the body may restore harmony to the affected area. The goal of Acupuncture is to restore normalcy to the body’s energy balance by stimulating a combination of ‘Acupoints’ located on the twelve meridians. 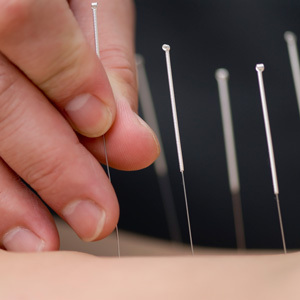 At Hockessin Chiropractic Centre we select from a variety of methods to treat an ‘Acupoint.” The technique may change with use of needles, tapping, electronic stimulation, laser beam, or pressure massage but the principle of Meridian Therapy is constant. Needle acupuncture, uses extremely slender needles, and the sensation is felt as a mild to moderate heaviness or tingling. The tapping “teishein” technique does not pierce the skin. It produces a mild to moderate sensation which can be compared to tapping a ball point pen on the skin. Finger pressure can also be used. More recently, Acupuncturists are employing electronic and laser stimulations to the ‘Acupoint’ with equal effectiveness. The technique chosen will be the one that best meets the patient’s needs.